"Many of these women (who travel alone) leave the country on the pretext of work or attending courses and seminars," he said. "With this declaration, we will know for sure where and for what she is travelling overseas," he said. Women's groups have expressed outrage at the plan. The National Council for Women's Organisations said it would infringe women's rights. Another group, Sisters in Islam, said the proposal was totally ridiculous and regressive, and assumed that women were less capable than men of making their own decisions. Campaigners have pointed out that letters of permission to travel would be very easy to forge. 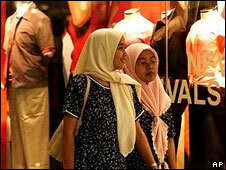 In recent years the influence of hardline Islamic groups has been increasing in Malaysia, but it is unclear whether this proposal has any religious motive.